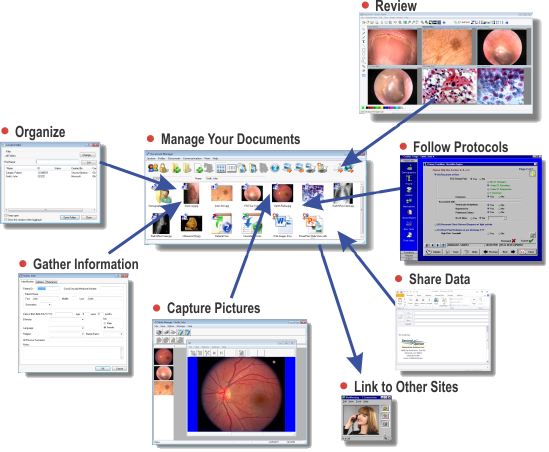 Second OpinionTM Professional was created for facilities that want to capture images, media clips, text documents, custom database forms, as well as more complex information, into a patient folder. It features integrated security and sophisticated annotation tools. The database is designed to be shared by many users across a Local Area Network (LAN) and via Store and Forward to multiple other locations. It also supports integration with other products and custom forms written in most major programming languages. Second OpinionTM Professional is also available to developers wanting to create custom add-ins. Please contact us for more information. Our Custom From Designer allows you to create powerful data entry forms without programming. The Report Template Designer creates specialized MS Word templates. Data fields and images are then merged into these templates creating a the report. Our MultiMedia Manager connects to a variety of cameras and imaging devices to acquire both images and video clips. Included with the program is our Image Viewer. Multiple images can be viewed simultaneously as Fixed Tiles or Free Form. It also supports Annotations and has both Enhancement and Measuring Tools. The Image Import Manager simplifies the process of importing images from external sources like digital cameras. Creating copies of secured content from a patient folders to burn to a CD/DVD or to import into third party systems is made easy using the Image Export Manager.